Perrysburg remains Wood County’s most economically diverse and thriving community and is one of Northwest Ohio’s best magnets for economic and business growth. It remains one of the best places to own real estate in the county and region. When it comes to “economic gardening,” no other community in Northwest Ohio is as successful in providing residents, business owners, and entrepreneurs with innovation-based economic development tools. Downtown Perrysburg Inc. and the Perrysburg Chamber of Commerce help to ensure the City’s B2B (business to business) networks thrive. 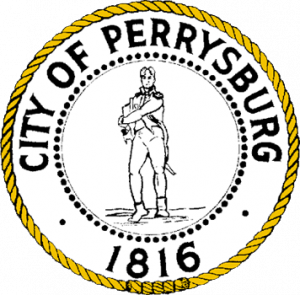 The City of Perrysburg – Wood County’s most economically diverse and thriving community. Perrysburg’s residential growth has increased 21.7% since 2000, and is the fastest growing community in the region. State average for residential growth in the last ten years was 1.7%. 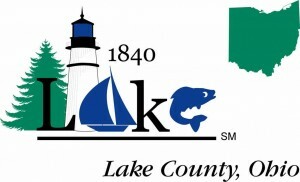 According to a recent study, Wood County was ranked as one of America’s Top Ten Small-Sized Counties (FEC Inc., 2012.). The ranking considers several measures within five areas: Investment, Talent, Sustainability, Place, and Diversity. These five areas serve as a foundation for future economic success. According to Stats America, Wood County has a 10-year per capita personal income (PCPI) growth of 7.3%, the highest in the region. Residents spend $3,500 more per capita on retail items than state average. According to the US Census, per capita income is $37,813, a 32% increase from the state average. Median household income from 2008-2012 averaged $69,341, a 30% increase from the state average, and one of the highest household incomes in the region. Median value of owner-occupied housing is $192,600, a 30% increase from the state average; Perrysburg has one of the highest housing values in the region. Over the last two years, Perrysburg has had more multi-family housing units under development than any other community in the region. This type of housing is extremely important in attracting young professionals and providing businesses with a diverse base of employees¹. 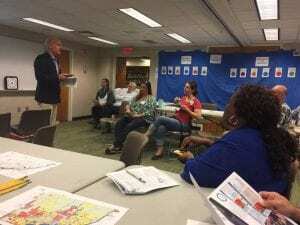 Recognizing the importance of its growing community, the Ohio Sea Grant College Program and Ohio State University Extension collaborated with the City of Perrysburg to conduct a Business Retention and Expansion (BR&E) Program. Because of this applied research effort, local leaders are better equipped to assist business needs in the city to achieve their growth objectives and to improve the overall business environment for the City of Perrysburg’s business community. Forty businesses plan to expand, modernize or renovate their businesses with firms planning to add jobs within the next 12 months. These firms will add between 58-177 new full-time equivalent jobs. 177 new jobs are estimated to represent $101,063 in additional income tax revenue and would contribute an estimated $6,737,505 in personal income to Perrysburg’s local economy. Jobs are projected as being added in the professional services, retail and commercial service sectors. 116 businesses plan to retain up to 2,880 full-time equivalent jobs. Identify and address concerns and issues of existing businesses by creating a value-chain of partners, including local and state government as well as private organizations and enterprises. Identify opportunities to stimulate local job growth, and establish and maintain long-term relationships among public and private entities associated with the Perrysburg local economy. To learn more about the City of Perrysburg BR&E program, see the final report. Click here to learn more about the Ohio BR&E Program. 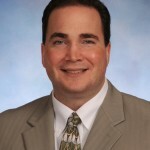 Joe Lucente is an Associate Professor for the Ohio Sea Grant College Program and Ohio State University Extension. The quality and long-term sustainability of any community depends on the caliber of its local leadership. One thing we can do to ensure a deep pool of qualified leaders is to engage individuals in leadership development, and the Toledo Local Government Leadership Academy is one such program. This educational offering marks the 15th year of an outstanding local partnership with the Toledo Regional Chamber of Commerce, Ohio State University Extension and the Ohio Sea Grant College Program and is the longest running local government leadership academy in Ohio. The 2016 class had twenty-eight graduates from various local government backgrounds. 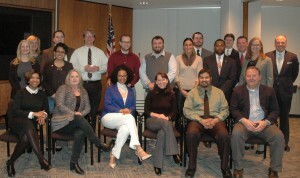 Since 2002, the Toledo Local Government Leadership Academy has produced over 300 graduates. 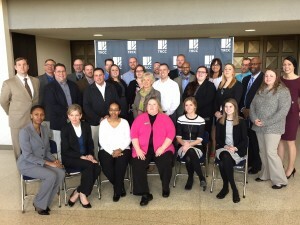 The Ohio Local Government Leadership Academy is designed for elected officials from county, municipal, and township governments, and for appointed individuals who serve on local government committees, commissions, boards or task forces. The purpose of the Academy is to provide useful programs that will enhance the leadership and decision-making skills of public officials. The Academy curriculum includes eleven workshops. A leadership certificate is presented to each individual who completes seven of the workshops. To earn the Leadership Certificate each candidate must complete five additional workshops from those listed below. Most workshops are designed for two hours. The Academy workshops can be offered on a local or regional basis as requested. The Academy will be sponsored by a local or regional organization or association that will be responsible for making all local arrangements, including facilities, equipment and securing participation. Enrollment fees will be determined by the sponsoring organization. Expense reimbursement will be paid to the instructor(s) for travel and workshop materials. For more information, contact Joe Lucente, Assistant Professor and Extension Educator, Ohio State University Extension and Ohio Sea Grant College Program. A shipwreck was discovered via side scan sonar on August 28, 2015 by Tom Kowalczk from Cleveland Underwater Explorers. The measurements and general location of the wreck appear to match the Argo, a barge which sank October 20, 1937. While further exploring the wreck October 23, 2015, Kowalczk noticed oily droplets on the surface of the water and a smell of solvent. An overflight by the Coast Guard Air Station Detroit on October 24, observed a 400-yard discoloration on the water, but a second flight on October 25 was unable to locate any discoloration. What is leaking? Is it hazardous to humans? Exactly what is leaking is unknown at this point, but the Argo was believed to have been carrying 4,762 barrels (over 200,000 gallons) – half benzol (a coal-tar product containing benzene and toluene) and half crude oil. 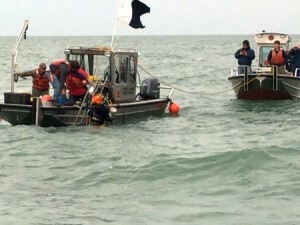 The Coast Guard has set up a regulatory safe zone, meaning boats are not to enter the area, with a 1,000 foot radius around the location of the wreck, primarily to avoid human exposure to any fumes. The coordinates of the zone are broadcast continuously on marine radio. Did the government know about the ship’s existence and make a plan for what to do if it leaked? NOAA knew of the wreck of the Argo and that due to its cargo, it was a risk for leaking oil. The Argo was identified as the shipwreck with the greatest pollution potential in the Great Lakes region. A March 2013 report, written when the exact location of the wreck was still unknown, recommended use of surveys to attempt to locate the vessel, along with ongoing outreach efforts with the local dive community and fishermen so officials would be made aware of any changes in the site. Does the leak pose a threat to drinking water or wildlife? 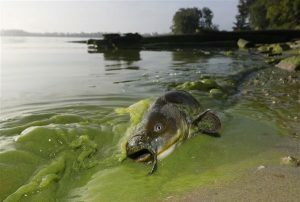 Coast Guard officials told the Toledo Blade that, as of October 26, 2015, the leak poses no threat to drinking-water supplies or to nearby aquatic life. What steps are being taken to secure the leak and mitigate any harm to the environment? The Coast Guard is overseeing an effort to identify and secure the leak, and is taking steps to ensure the safety of responders within the regulatory safety zone. Where can I learn more about Lake Erie shipwrecks? Lake Erie is home to a number of shipwrecks, many with historical significance. Ohio Sea Grant Extension Educator Joe Lucente helps run the website Shipwrecks & Maritime Tales of the Lake Erie Coastal Ohio Trail at ohioshipwrecks.org, which has detailed information on the history of wrecks, including maps of confirmed wrecks. CLUE donated many of the pictures featured at ohioshipwrecks.org, Lucente says (in a downloadable full-color brochure featuring maps and history of 28 Lake Erie shipwrecks). For a list of additional resources and the complete article originally published on October 27, 2015, go to: go.osu.edu/argoleak. Ohio State University’s Ohio Sea Grant Program is part of NOAA Sea Grant, a network of 33 Sea Grant programs dedicated to the protection and sustainable use of marine and Great Lakes resources. For more information, visit ohioseagrant.osu.edu. Click on the image above to view the final report. Attraction of new businesses is a highly visible activity in most community economic development programs. Yet research has shown that a community’s existing businesses account for up to 70% of all net change in local employment, and up to 86% in rural areas. This, among other reasons, is why the retention and expansion of existing businesses has become an essential activity of many local and regional economic development programs. Recognizing the importance of local marinas, the Lake Erie Marine Trades Association and Ohio Department of Natural Resources Office of Coastal Management in conjunction with Ohio State University Extension and the Ohio Sea Grant College Program established a Business Retention and Expansion (BR&E) Program to assist these companies in achieving their growth objectives and to improve the overall business environment of Ohio’s Lake Erie Marina Industry. To read more about this program or to view the final report, click here. To learn more about the Ohio BR&E Program, visit Ohio State University Extension’s BR&E website. Are leaders born or are they made? 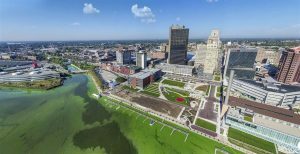 While the philosophers debate that question, consider this: For over a decade, Extension and the Ohio Sea Grant College Program have partnered with the Toledo Regional Chamber of Commerce to provide training focused on leadership skill development to more than 300 aspiring, new and experienced public officials. This educational offering, now in its 13th year, is the longest running local government leadership academy in Ohio. The Academy curriculum includes materials that support eleven face to face workshops and is designed for elected officials from county, municipal and township governments, and for appointed individuals who serve on local government committees, commissions, boards or task forces. The 2015 class graduated twenty-five participants from a variety of local government backgrounds. For more information about Academy offerings, including general and elective workshop topics, click here. To read more about this program’s impact, click here. To weigh in on the question (born or made?) feel free to post a comment!! Most every decision we make results in some sort of impact. Take our development decisions, for example. In some way, they impact sustainability. How can we better understand the impact of our decisions? 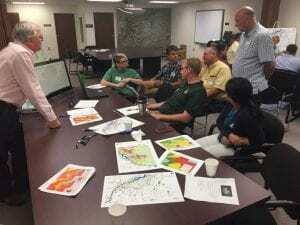 Tipping Points and Indicators is a collaborative program that gives land use planners, natural resources managers and stakeholder groups in the Lake Erie Watershed the information they need to enhance local economies and protect natural resources. Using its decision support system and action planning process, communities can determine how close a watershed is to the thresholds (or “tipping points”) that might change the way aquatic ecosystems function and pinpoint the land use practices driving them. 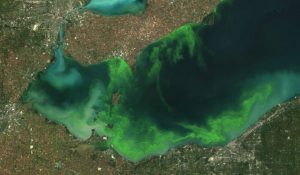 Tipping Points and Indicators is a new Great Lakes research and Extension program comprised of a web-based, data driven decision support system and a facilitated community visioning and action planning process designed to enable effective protection and management of natural resources throughout Great Lakes. The web-based portion is available at tippingpointplanner.org. The facilitated portion yields an action plan that includes an overview of the current community status and whether the community is nearing or exceeding Great Lakes tipping points. It also provides customized education strategies, example policies and sample ordinances to improve current conditions. The program is targeted to land use planners, natural resources managers and stakeholder groups with an interest in assessing community sustainability using Great Lakes tipping points. Research team members identified land use indicator variables that determine the threshold, or tipping points, that when exceeded can impact aquatic ecosystems. 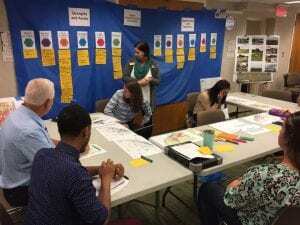 Great Lakes Sea Grant Network Extension Specialists developed the associated website and facilitation process that guide community groups through an interactive watershed action planning process. Touch screen monitors are used to enable community groups to collaborate and explore the website, tools and GIS maps to determine planning priorities linked to community values. The overall program goal is to enable the development of sustainable, watershed-specific land use strategies. 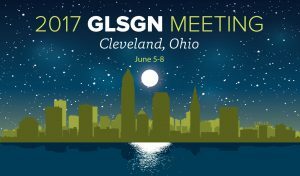 The Tipping Points and Indicators planning process is facilitated by Great Lakes Sea Grant specialists. Contact your state facilitator and request a planning workshop for your community.